We’ve updated our summary page to make it easier to see how your account is doing, by highlighting your total account value and your paid earnings. 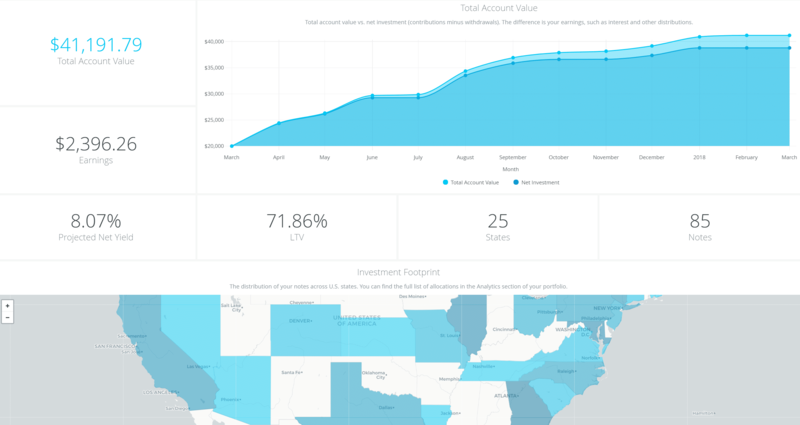 The “Total Account Value” graph makes it easier for you to see how your account’s value has changed over time, and the Portfolio Statistics summarizes your current allocations. Though the investment footprint is not a new feature of the AlphaFlow Optimized Portfolios dashboard, it is our clients’ favorite visualization tool! In a single shot, you can see where your loans are allocated across the country. 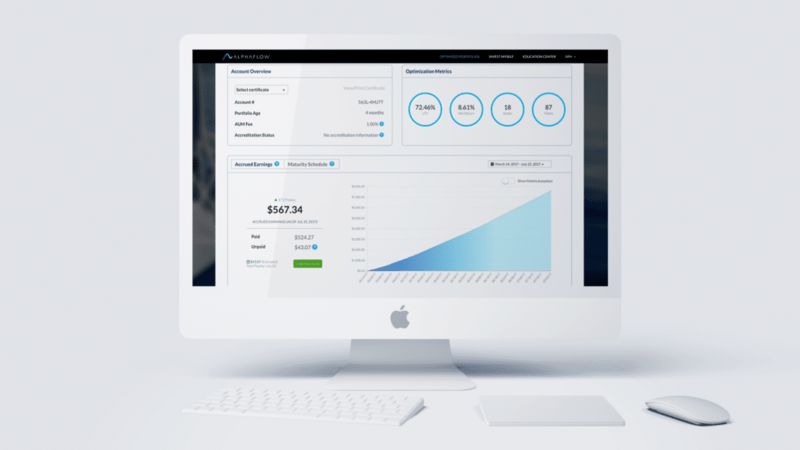 Our new analytics section provides you with more transparency into your investment. We’ve added a new panel to summarize what states your notes are in, and added a section that shows the servicing status of the notes in your portfolio. Missed payments are a fact of life investing in real estate. With many borrowers out swinging hammers and not at their computers, many perfectly healthy loans will miss some payments. This is why lenders don’t consider a loan in default until a borrower is 60 days late (delinquent) or more on a payment. Even then, it could be because they’re in the middle of selling or refinancing the property and are awaiting a payment before paying off all the back interest and the loan all at once. Be assured, we’re always on top of our lenders to understand what’s going on with the loans in your portfolio, delinquent or otherwise! With the introduction of our monthly statements, we made it easier to understand what happened in your portfolio each month. The “Account Activity” section takes a step further, and gives you a summary of each month’s activity in a single place, showing all account inflows and outflows! At AlphaFlow, our mission is to create the most passive, diversified and transparent real estate investment product on the market. While our clients love being hands-off in selecting and managing investments and rebalancing their portfolios, they are very hands-on when it comes to understanding how their money is put to work and how their portfolios are performing. We are excited to share the redesigned AlphaFlow Optimized Portfolios dashboard. Many improvements were made and are largely based on client feedback. With this redesign, we have laid the foundation to continually improve our reporting and bring complete transparency to client investments. With the new earnings card, you get complete transparency into what you’ve been paid and how much you’re accruing. Each day you can check in to see exactly how much you’ve earned. We also provide a visualization of earnings over time so you can see how your money grows. Scrolling over the graph shows you exactly how much your earnings were on that particular date, and you’re able to adjust the date range to see your earnings over time. With the new maturity schedule, you can see when the notes in your portfolio are scheduled to be repaid, giving you more visibility into your projected principal repayments*. With the portfolio value table, you get a comprehensive overview of essential investment data. Every dollar of your portfolio is clearly laid out: total invested capital, cash earmarked to be invested into new notes, cash reserves (returned principal and earnings available to be withdrawn or reinvested, your choice! ), and unreturned matured allocations (principal repayments that are being processed). See how your optimization metrics have changed on a daily basis with the Optimization Metrics card. This card shows your portfolio’s average LTV, net interest rate, geographic diversification, and how many notes you’re currently invested in. Though the investment footprint is not a new feature of the AlphaFlow Optimized Portfolios dashboard, it is our clients’ favorite visualization tool! 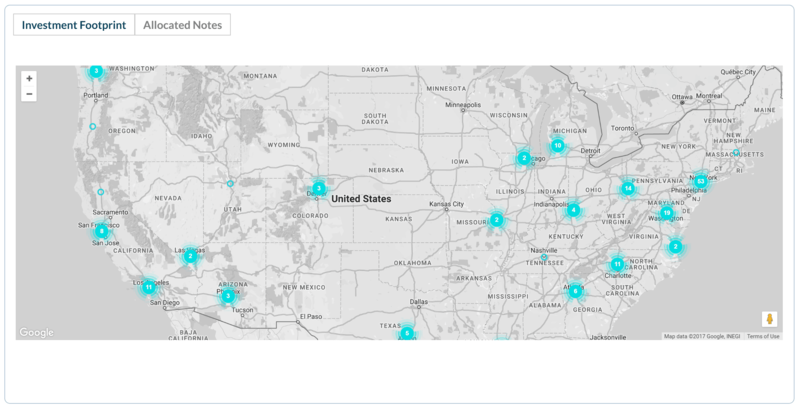 In a single shot, you can see where your loans are allocated across the country. The map does more than aggregate loans into an MSA (metropolitan statistical area). You can zoom in and see where the loan and underlying property is located. Click on the pin to open the loan details. For a comprehensive, loan-by-loan summary, tab into Allocated Notes where you can also export the list of notes as an Excel file. When we launched the industry’s first automated real estate investment platform earlier this year, we knew that metrics and data would be a key to our clients’ experience of a new investment product: actively managed, broadly diversified, passive income-producing personal portfolios without the high fees and high minimums of traditional real estate investing. We are committed to providing the most transparent, thorough and valuable data and metrics. Open dialogue with our clients about what they need, and want to see, helps us to create a better user experience through constant improvements. 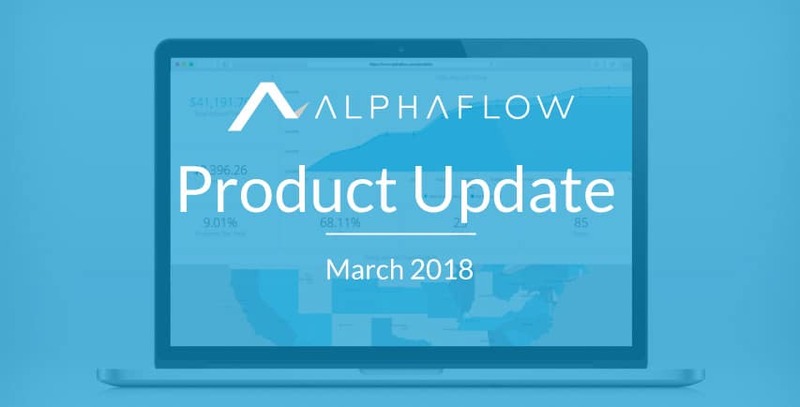 To that end, we are already working on changes to the Balances page of the AlphaFlow Optimized Portfolios, in addition to providing downloadable monthly account statement reports. We’ll be sharing more about those changes soon! *The dashboard images shown above, and all the content of the dashboard, are provided solely as an example, and do not relate to any actual or model underlying real estate loans or mortgage notes, or any actual or model investments by investors. AlphaFlow does not represent, directly or indirectly that any information on this page of its Website, including but not limited to any graph, chart, formula or other device: (a) can in and of itself be used to determine what securities to buy or sell, or when to buy or sell them, or (b) will assist any person in making his/her own decisions as to which securities to buy or sell, or when to buy or sell them. Alphaflow does not make investment recommendations, and no communication through this Website or in any other medium should be construed as such. Any sale or purchase of securities is in the sole discretion of, and is conducted directly between, the issuer and the prospective investor.